The real divide in society is between rich and poor and not Brexit, Labour leader Jeremy Corbyn has told party members in Llandudno. At Welsh Labour conference Mr Corbyn said his party is trying to end the Commons deadlock on the issue. He said he did not want to pit remain voters in one part of the country against leave voters in another. Learn how to break free from this toxic relationship and reclaim your life. Break-through organic gardening secret grows you up to 10 times the plants. Learn Lawn Care Secrets With ThisStep-By-Step.100 Guaranteed. Meanwhile Welsh Labour leader Mark Drakeford said Brexit should not be used to “short-change” Wales. He also announced £2.3m to offer sanitary products to all learners in schools and colleges. The Labour frontbench in Westminster is taking part in Brexit talks with Theresa May’s government. “Only Labour has been consistently trying to find a way through the deadlock,” Mr Corbyn said. “Labour doesn’t believe the real divide in society is between people who voted to remain or to leave the European Union. 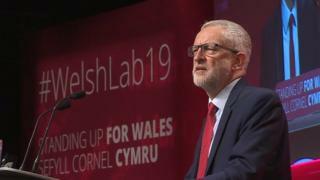 Labour does not want to “set the hard up family in Cardiff that voted to remain, against the hard up family in Wrexham that voted to leave,” Mr Corbyn said. The politician said people that believe leaving or remaining in the EU are ends in themselves are “wrong”. Mr Corbyn said the previous weeks in politics had been “intense” and that the Westminster political system had not come out of it well. He said it was “scandalous” that the offer of talks on Brexit had come so late from the PM. His party will continue to talk to the government, the leader said, to abide by the result of the referendum without “wrecking our economy”. But if that is not possible all options should remain on the table, including a public vote, Mr Corbyn said to applause from delegates. There are calls in his party for another referendum on whether the UK should leave the EU. In his conference speech, Mr Drakeford told delegates that Theresa May was the “first Prime Minister in history to fall on her own sword – and then to miss it”. The Welsh Labour leader accused the Conservative party of being “wrapped and trapped by a mythical nostalgia for a past remembered only by its ever diminishing membership”. In a speech which did not mention a further referendum, Mr Drakeford said “the chaos of Brexit” is seen as an opportunity for Mr Cairns “to grow his own office”. “So let me issue this very clear warning to the Secretary of State for Wales,” Mr Drakeford said, referring to Alun Cairns. The AM for Cardiff West said if Mr Cairns “continues to persist in using the so-called UK Shared Prosperity Fund” – which is aimed to replace EU funds – “as a means of by-passing the National Assembly, as a way of using Brexit to short-change the people of Wales, then he is heading for a fight”. Will Labour push for a public vote? What are the Brexit sticking points? The FM said EU funds must be replaced, and devolved powers kept: “Not a penny less, not a power lost”. Currently EU funds in Wales are spent by a body of the Welsh Government. Last year Theresa May would not confirm if the new fund would be devolved. Mr Drakeford said he had a “simple message” to voters and Labour members on the European elections, saying they should be taken as seriously as a general election. 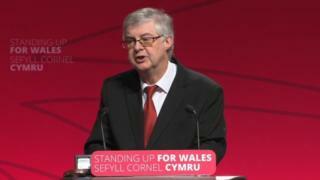 Mark Drakeford’s first speech as Welsh Labour leader was well received in the hall, and contained a popular policy announcement on combating period poverty. But it was curiously retrospective given that Mr Drakeford only took up the reins of government in December. Perhaps that’s because it was also, undoubtedly, an appeal for party unity at a time when Brexit is turning both main UK parties upside down and inside out. There was the promise of legislation on fair working and a call to delegates to front up in the event that elections to the European Parliament take place next month. But the divisive issue of another Brexit referendum? That was the proverbial elephant in the room. 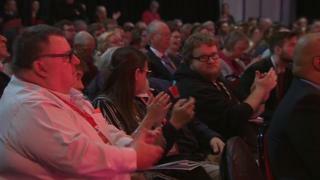 New Labour MP Ruth Jones, who won the Newport West by-election last week, gave the welcome address at conference, telling delegates that in devolution’s 20th year “our task is to stand up for the people of Wales”. “People have had enough after a decade of austerity,” she said, calling it a “political choice, not a financial one”. 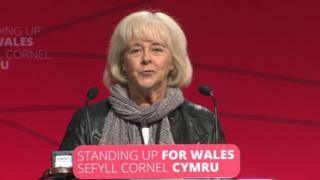 Shadow Welsh Secretary Christina Rees appealed “for calmness in a country that is divided because of the inexplicable way the prime minister has handled the Brexit negotiations”. She said language in emails and on social media had become “intimidating”, and had reported the worst cases to the police. “It’s changed from ‘I’m writing to tell you I don’t agree with you’ to ‘you’re a traitor, letting down people who voted for you’,” she said. Success mastery X is the ultimate blueprint for achieving success. The Cleaner That 'Digests' The Stains and Odors Lingering In Your Home.